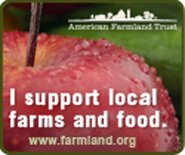 Like most everyone, I know how important pollinators are to the food chain. What I didn’t realize, until I read this book, was how artisanal honeys, like fine wines or single source coffees, have distinctive flavors rooted in terroir. To find a spot on my shelf these days a cookbook needs to be inspirational, have a strong point of view, and help me explore new culinary cultures. 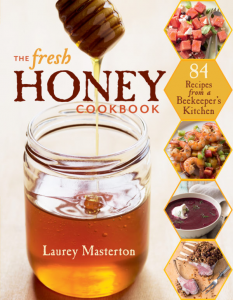 The Fresh Honey Cookbook, 84 Receipes from a Beekeeper’s Kitchen by Laurey Masterton (Storey Publishing, North Adams, MA, 2013) meets all of my criteria. The book is at once a manifesto on the importance of bees, a resource for hobby beekeeping, an introduction to honey varietals, and a collection of tasty, yet straightforward, seasonal recipes centered on honey. Masterton manages to pack all of this into 206 well-designed pages of clear prose and beautiful photography by (Asheville, NC based) Johnny Autry. Laurey Masterton writes in her introduction that she hadn’t really thought much of bees until she was asked to prepare a meal for schoolchildren who were learning about the importance of honeybees. Her interest was piqued and, when she learned that honeybees are responsible for every third bite we eat, she decided to become a beekeeper. As a chef, Masterton’s beekeeping opened up a whole new world of food connoisseurship. In a beautifully produced chapter early in the book she unpacks the world of honey through sight, smell, flavor, and species. It turns out that the flavor profiles of honey produced by various plant species are as individual as wine is to grape varietals. Masterson’s book follows the calendar. Each month includes a menu and featured honey varietal. Along the way we learn about the rhythms of beekeeping and honey trivia. For example, the October chapter features eucalyptus honey, which Masterton says is on the dark side and is perfect for the chillier days of autumn. There’s also fascinating information in this chapter about beeswax: Bees eat their own honey to make beeswax and it takes 6-8 pounds of honey to make 1 pound of wax. Other months each feature another honey varietal: January, orange blossom; February, tupelo; March, acacia; April, avocado; May, raspberry; June, tulip poplar; July, sourwood; August, blueberry; September, sage; November, cranberry; and December, chestnut. But of course, a cookbook is judged on its menus and recipes. And I tried several. Though Masterton does give a helpful list of sources for her honey varietals, I decided to see what I could find locally. Most stores offer a generic “wildflower” honey, and I already have a number of wildflower honeys from local beekeepers, which are organized by season, but not by specific flower. After visiting several grocery stores, I was finally able to find three distinctive honeys: cranberry, orange blossom and acacia — all at the Honest Weight Food Co-op in Albany. I wasn’t sure that the honey varietal would make that much difference in these recipes until I worked with cranberry honey, which is the chosen honey for the November chapter. Masterton describes the taste as warm with cooked fruit hints and no aftertaste. It did have a delicious, mild yet distinct fruity taste. It made a fantastic dressing for the cookbook’s recipe for California endive salad with pomegranate seeds and shaved parmesan. Because the November menu was so focused on Thanksgiving-type food (think cranberries), I also substituted the cranberry honey for orange blossom honey in a marinade recipe for Meyer lemon and honey marinated chicken skewers included in the January menu. I don’t know whether Masterton’s preference for using orange blossom honey as suggested in her recipe would have varied the flavor substantially, but I do know that all the recipes I tried were quick, easy, and delicious! But interestingly, I saved the leftover salad dressing and used it in one of my favorite kale salad recipes the next day with disappointing results. The kale salad needed a brighter, lighter, less fruity honey than the cranberry honey. From that accidental experiment, I realized that these recipes, though simple to prepare, feature carefully balanced flavors that connect with the distinctive qualities of the honey varietals. I’m looking forward to adding more honey to my shelf and working through more of the recipes.